A local farm literally only a few blocks away sells blueberries by the tubful. There's also a U-Pick option, which sounds lovely but doesn't work with my schedule. Their business is a bit up this year as most people who would normally travel to Gunma, Ibaraki or other prefectures a bit north of Tokyo for a fruit vacation aren't because of concerns about radiation. Fruit growers, like tea farmers and so many others, have been hard hit by the Daiichi Power Plant crisis resulting from the March 11th Earthquake. 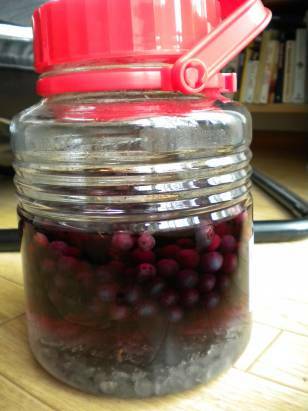 The berries are expensive (about 600 yen for 250 grams or upwards of $7.00), so I decided to freeze some and make blueberry shu out of the rest. I'd need a goodly number of berries for jam, and while I love the flavor I've also got to heed current calls for conservation. While the energy would be well-used, I can't quite justify it. Plus, it looks like we'll be needing to conserve into the winter months and it occurred to me that a pretty little glass of blueberry shu might warm me up as much as my long underwear. I essentially followed the same recipe I used for the ume, yuzu, and rhubarb shus. 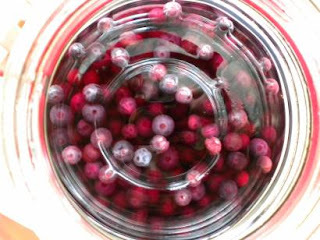 Wash the jar, plop in the ingredients, screw on the lid, and wait. Our laundry area, a.k.a. the 'shu closet', is getting a bit crowded these days, but I can't resist a good experiment! Note on the photos: The top photo is looking down into the jar. The smell was fantastic! The bottom photo is a side view of the jar to see how things are progressing after about ten days. This is such a fabulous way to preserve precious blueberries! I appreciate your thoughtfulness about how to conserve energy in the way you preserve. Your blog has become one of my favorite sources of inspiration. Thank you! Thanks, Sarah Elaine! I did up some plums (sumomo) just before we left on vacation, too. I've got to write up that post in between naps, bike rides, and tasty snacks from area farms. :) I'm also thinking that the fruit will make a tasty jam at some point.